On March 11, 2011, a historically large earthquake struck Japan, which gets a large percentage of its electricity from nuclear power plants. All affected plants automatically shut down by inserting control rods into the cores (an operation called a SCRAM). After each SCRAM, the nuclear chain reaction in each core stopped and total heat generation went immediately down to about 6% and decreasing. However, nuclear reactors cannot be turned completely off immediately. Splitting atoms produces smaller atoms, many of which are radioactive. These produce quite a bit of heat as they emit alpha, beta, and gamma radiation, even in the absence of a chain reaction. As these fission products decay, the heat generation decays away with time exponentially. The plants were not built to be able to handle an earthquake and tsunami of the magnitude seen. This error in judgment and knowledge of the environment at that site led to under-engineering of the backup systems. This has caused the loss of these plants, a general downturn in public acceptance of nuclear energy, and radioactive contamination of a large chunk of Japan. So far, no one has died from radiological reasons (2 workers were lost in the tsunami). Even if a nuclear reactor is shut down, it still produces quite a bit of decay heat that must be cooled to prevent the fuel from overheating and melting. If all the fuel melts (known as a meltdown), there is a higher chance that the radiation that was contained within the pins could get outside the reactor. The emergency diesel generators and/or their fuel supplies at the 5 of the 6 reactors at the Fukushima Daiichi site were flooded by the tsunami that followed the quake. At this time, the plants entered a station blackout condition. Extra engineered features that do not require electricity to operate attempted to remove the decay heat and prevent fuel melting, but these can only work for a certain amount of time, and they eventually failed in units 1 through 3. 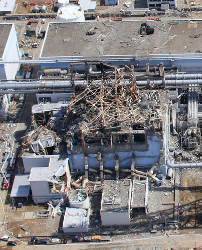 Unit 4’s fuel was all in the spent fuel pool (the reactor had been undergoing an outage at the time) and it is unclear why there was a hydrogen explosion there. Extremely large earthquakes leading to loss of decay heat removal is considered one of the highest likelihood events to cause core damage in a nuclear reactor. After station black-out, unit 1’s engineered safety system (an isolation condenser, or IC) went dry after 18 minutes (should have lasted days). Hours later, the fuel melted and produced hydrogen, which soon exploded. In units 2 and 3, a system called the RCIC (which uses steam generated by the decay heat to circulate water) cooled the reactors for ~2 days before failing, finally allowing the fuel to melt. Fuel melted in the reactor vessels of units 1 through 3 and seems to have penetrated through the reactor pressure vessel. In unit 4, the fuel in the spent fuel pool seems to have melted, probably due to a leak in the pool (since it should have taken at least 10 days to boil off that much water). When fuel gets very hot in these reactors, the Zirconium cladding interacts with water and produces hydrogen. In units 1 through 3, hydrogen explosions occurred and caused damage to the reactors. Today’s concerns seem focused on the spent fuel pools, particularly in units 3 and 4. White smoke was seen coming out of unit 3, indicative of burning Zirconium and therefore melting rods. With the secondary containments damaged, these exposed spent fuel pools would have a direct path to release radiation into the environment if the water level truly has dried out, leading to local radiation levels that would make it difficult to continue cooling operations on the site. This development is extremely surprising because spent fuel pools do not require substantial cooling to keep cool. If a firetruck could hook up outside the building and pump in water, this problem seems like it would be avoided! We’re anxiously awaiting details and hoping off-site power can be restored immediately. We keep cheering on and appreciating the efforts of the heroes who are working on this disaster in the high radiation environment. A third hydrogen explosion occurred yesterday at unit two at Fukushima, but rather than happening in the not-so-important secondary containment, this one happened below the core, near an area called the suppression pool. Pressure dropped and coolant levels did not rise after this, suggesting that coolant is going from the pressure vessel into the primary containment. Meanwhile, at unit 4 (which was shut down before the earthquake), a fire broke out last night and was subsequently extinguished. The spent fuel pools in that unit (and the others) is in need of cooling as well, and will probably be doused with cold water. Decay heat in the spent fuel heats up the water surrounding it. As in the core, if the rods are exposed to air, they may melt and release their radiation. Very high doses were measured on the site when the fire happened (40 rem/hr), but these have since fallen drastically. Readings off-site are still fairly low. Three of the 6 reactor cores on the Fukushima Daiichi site are experiencing coolability problems and have experienced partial melting of the fuel elements. Two barriers of protection are still intact (the pressure vessels and the reactor containments), but the vessel in at least one of the reactors has so much pressure in it (from steam buildup) that attempts to pump in seawater are failing. The valve that is supposed to relieve this pressure is apparently stuck. Efforts to ensure cooling are ongoing. In an attempt to piece the details together, it seems that Fukushima shut down like the other plants and the main pumps failed probably due to the loss of offsite power (since the whole electricity grid went down at the same time). At that time, diesel generators kicked in to power the emergency core cooling systems to cool the decay heat. Then, when the tsunami hit, the redundant diesel generators failed (probably due to fuel tank and/or piping problems). This kind of large event is known as a common mode failure. With no power for the emergency pumps, the water covering the hot fuel rods started to heat up. At this point, operators would have been trying to find some way to get the coolant flowing past the fuel rods again. As the coolant heats up, it produces steam which pressurizes the containment of the reactor. Hydrogen can also be produced, which is explosive. At this point, it seems that the operators opened a valve to reduce steam pressure in the containment. Oxygen and hydrogen mixed between the containment and the reactor building, resulting in an explosion that allegedly did not damage the primary containment. Generators and batteries have arrived on site and seawater impregnated with Boron (a strong neutron absorber, to keep the reactor well-subcritical) is being pumped into the containment to help remove the decay heat from the fission products. Some fuel may have melted already, so we’re hoping that they are able to provide reliable cooling to the rest of the core until the heat generation decays down to safe levels. By the way, some later-generation nuclear reactors are capable of doing decay heat removal with natural circulation, so no pumps or electricity would be needed for this event. This is called passive safety, and is an important feature of modern designs. The best live updates so far are at Wikipedia timeline of Fukushima, with more coverage at The NEI and at World nuclear news as well.